See Ixora chinensis Lam. for a basic description. Rosea has rose-coloured flowers. ‘We are informed by Dr. Wallich, […] that this fine shrub is a native of the hilly parts on the borders of Bengal, about Silhet, whence it was introduced into the Botanic Garden at Calcutta, in 1815, by Mr. M. R. Smith. “This shrub,” Dr. Wallich observes, “is exceedingly elegant, on account of its large round corymbs, which for eight months of the year are produced in constant succession. The colour of the flowers is pale pink, gradually becoming reddish as they grow old, beautifully contrasting with the shining dark green leaves.” ’ [BM t.2428/1823]. 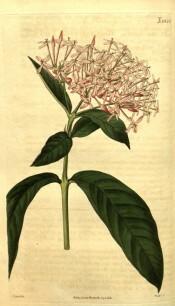 As discussed under Ixora coccinea L. there were marked differences of opinion among early 19th century botanists on the classification of Ixias. ‘Rosea must not be confounded either with the pink variety of cuneifolia, or with that of coccinea (flammea of Smith, chinensis of Lam. and stricta of Roxb. ).’ [BR f.540/1821]. ‘This is a very pretty species: it is a native, according to Dr. Wallich, of the hills on the borders of Bengal, near Silhet.’ [LBC no.729, 1823]. Listed in the 1850 and 1857 catalogues [T.585/1850]. Obtained from the London Horticultural Society. Included among desiderata in a letter to John Lindley dated 15th February 1848. Macarthur’s copy endorsed ‘arrived’ [MP A2933-1, p.157]. It was also requested of Loddiges’ nursery on 13th February, 1848 [MP A2933-1, p.172]. See also Ixora coccinea L.